You might think of our solar system as our most immediate celestial neighborhood — and when compared with the vastness of the universe as a whole, it certainly is — but it’s still pretty difficult for researchers to accurately spot objects hanging out on the fringe. But now, thanks to the combined efforts of a trio of observatories here on Earth, NASA has been able to confirm the existence of an all-new moon, and it’s an extremely cool customer. The moon, which as of yet remains unnamed, was detected orbiting what is believed to be the third largest dwarf planet in our solar system. The host planet is called 2007 OR10, and it resides in the massive disc of debris and space material left over from our solar system’s creation. 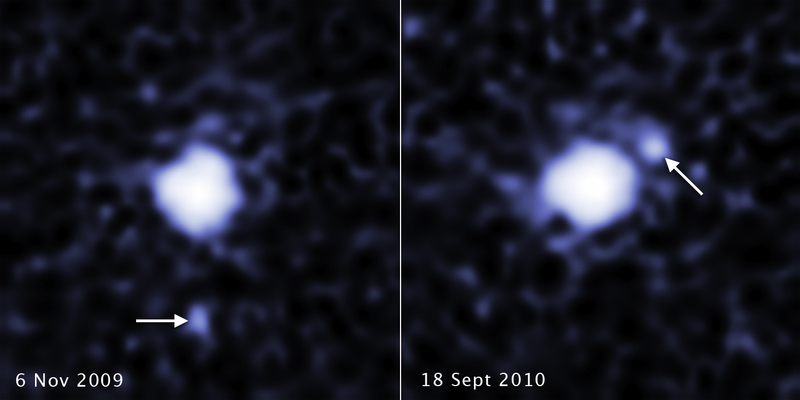 Because of its location and extreme distance from the sun, both 2007 OR10 and its newly-discovered moon are thought to be very, very cool. It measures somewhere between 150 miles to 250 miles in diameter. Csaba Kiss, the lead researcher and author of the paper revealing the moon’s existence, notes that the discovery is helping to reinforce the notion that the birth of our solar system and initial creation of the planets we now think of as neighbors was a very active period. “The discovery of satellites around all of the known large dwarf planets – except for Sedna – means that at the time these bodies formed billions of years ago, collisions must have been more frequent, and that’s a constraint on the formation models,” Kiss said.